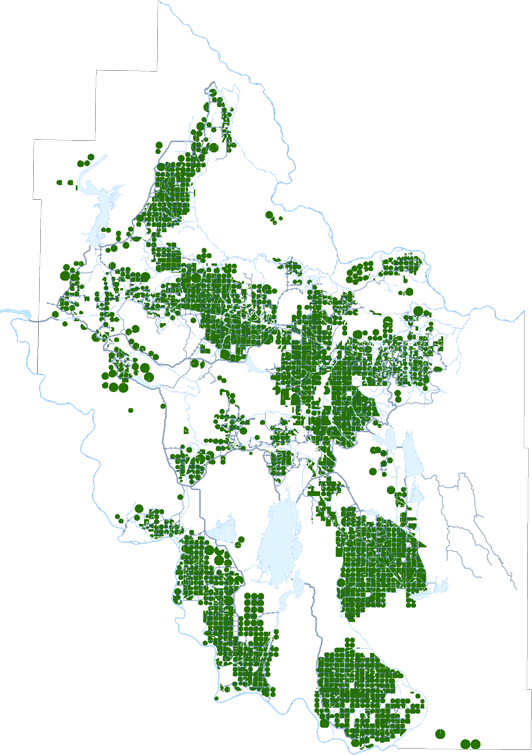 The Eastern Irrigation District (EID), one of thirteen irrigation districts in southern Alberta operates under the authority of the Alberta Irrigation Districts Act [RSA 2000 c. 1-11]. The administrative boundaries of the EID, bounded by the Bow River in the south and the Red Deer River in the north, encompass approximately 1.5 million acres of land. The District’s primary business is the management of an extensive water distribution network in support of irrigated agriculture. In addition to conveying water to approximately 300,000 acres of irrigated farmland owned by private families and corporations, the EID also conveys water through their distribution network to benefit municipal, industrial, wildlife habitat and recreational purposes. The EID also owns an expanse of native and improved grassland, managed for the benefit of the irrigators and primarily supporting the local cattle industry. The Eastern Irrigation District is governed by a Board of seven Directors elected by and from the 1,100 irrigators of the District. The EID employs approximately 80 individuals who carry out the day to day management and operation of the District. The area now known as the Eastern Irrigation District is situated within the Palliser Triangle - that area of the western prairies characterized by low precipitation. The average annual precipitation within the area of the EID is 30 centimeters (12 inches) with an average of approximately 15 centimeters (6 inches) falling during the growing season. This average is much less than the water requirements to successfully grow most agricultural crops. In 1903 the Canadian Pacific Railway (CPR) received title to 1,215,000 hectares (3 million acres) of arable land on the rail line between Medicine Hat and Calgary from the Dominion of Canada as final payment for the construction of the national railway. The area now known as the Eastern Irrigation District was part of this land grant and was referred to by the CPR as the Eastern Section lands. Though the amount of sunshine hours and the heat units were adequate for growing crops, the CPR felt settlement of the Eastern Section lands would be challenging because of the lack of precipitation in the area. Because of this, the CPR believed the actual value of the land granted to them was less than the value calculated by the Dominion of Canada for payment. To add value to the land grant, the CPR convinced the Dominion of Canada to allow development of an irrigation conveyance system to the Eastern Section lands. The proposed head works of the irrigation system, to be located on the Bow River, would divert water into a network of canals to supplement precipitation and assist in the production of crops in the Eastern Section lands. The CPR hoped that construction and operation of an irrigation conveyance system would support the successful production of agricultural products and assure the company revenue from settlers in the form of land sales, water conveyance payments and fees for the transportation of settlers, supplies and agricultural products on the CPR rail line. In 1910 the CPR commenced construction of a diversion structure on the Bow River southeast of the community known as Bassano. During the same period water conveyance canals, wooden and concrete flumes and reservoirs were constructed to allow water to flow by gravity to most areas of the Eastern Section lands. At the same time and in conjunction with the Dominion of Canada, the CPR undertook an extensive marketing campaign to attract settlers to the area. For close to 20 years the CPR owned and operated the irrigation conveyance infrastructure. Their ownership of the system coincided with the economic depression and drought of the late 1920’s and 1930’s. Plunging commodity prices resulted in many landowners being unable to sell and ship their product to market. As a result, many landowners, not able to sell product and make their payments to the CPR, made the decision to leave the area. With more and more landowners defaulting on their payments, the operation of the irrigation system became a non-profitable venture for the CPR, a company whose main operations were already significantly impacted by the economic depression. $300,000 to assist the landowners with first year operating costs. upon finalization of the deal, the CPR would have no further interest in the Eastern Section lands. Upon agreement between the two parties, the Eastern Irrigation District was officially created with the passing of the “Act to incorporate the Eastern Irrigation District” by the Province of Alberta on April 23, 1935.